In the early spring of 2006, shortly before Charlie was born, Mark and I cleared out a neglected corner of our yard and made a garden bed in honor of Charlie’s upcoming arrival. Later that spring I wanted to plant peonies in the new garden. 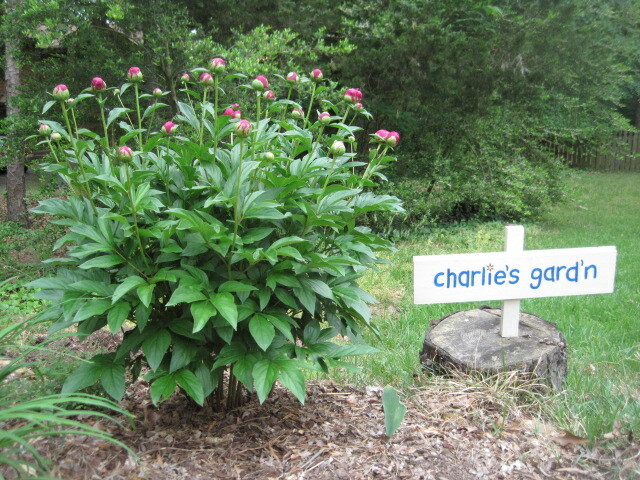 I had carried peonies in our wedding and thought it would be lovely to have some in Charlie’s garden. 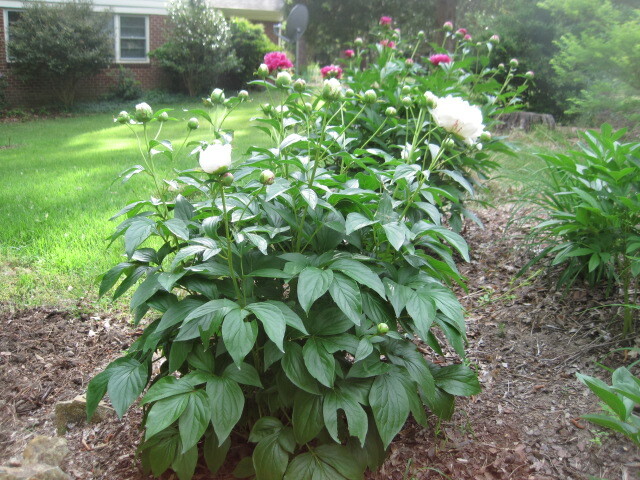 Peonies at the nursery were quite expensive but I found a “good deal” online: five peonies for about $30. However, I didn’t notice the fine print — they wouldn’t be mailed until the fall and they came “bare root.” Bare root basically means what it implies: the peonies didn’t arrive as anything that resembled a plant, instead I got a bunch of brown spindly looking things that were, in fact, just bare roots. 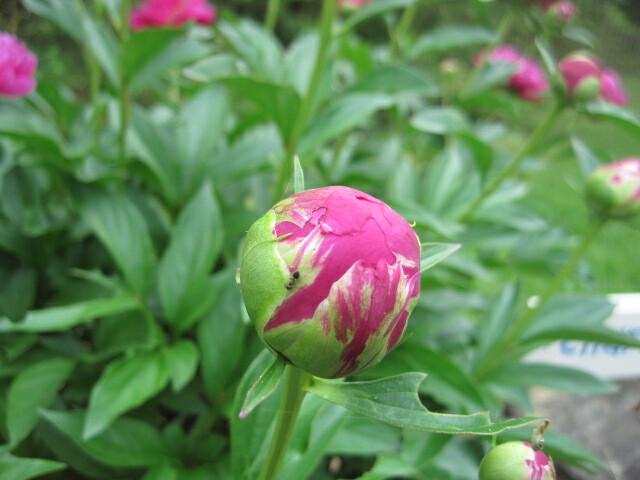 The key to planting peonies is to plant them somewhat shallowly. If they’re planted too deep, they won’t bloom. To plant bare root peonies, dig quite a wide hole. Place the root in the hole with the 3-5 “eyes” (growth buds) pointing upward. Make sure not to plant the eyes of the root deeper than two inches below the surface of the garden bed. One of the disadvantages of planting bare root peonies is that they take several years to establish before they put forth any blooms. I planted mine in the fall of 2006. 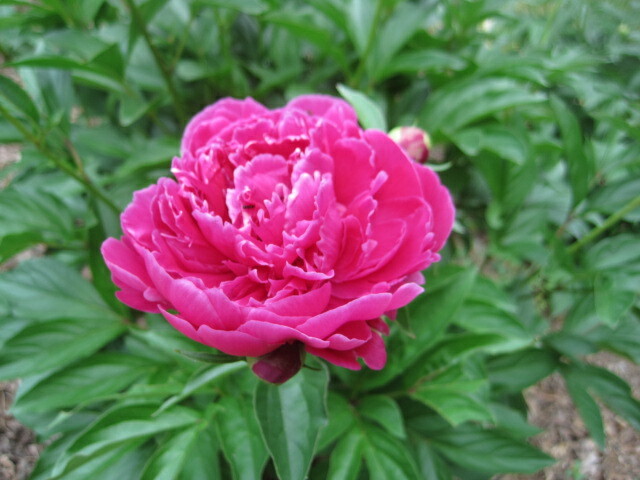 This is the first spring that the peonies have impressed me — normally I just get one or two blooms. And, truth be told, currently only two of the five peony plants are impressive; just a single bloom graces the other three. When large groups of peonies are planted and in bloom they’re a real showstopper. I hope my five peonies become that someday. Harmless ants frequently gather on the buds to collect nectar. I wanted to cut a bunch of the flowers and bring them inside for a yard bouquet, but Mark asked me not to since he wanted the plant to be full of flowers. But I couldn’t resist bringing just one flower in the other day for our anniversary. i love this! peonies are my favorite. That’s the trouble, or the good thing, about gardening: one is forced to learn patience. 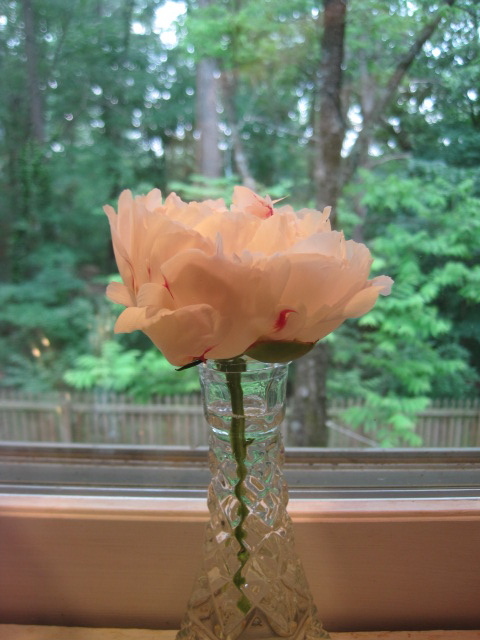 Is that really a yellowish peony in the vase, or is it a trick of the light? I didn’t think they came that color. 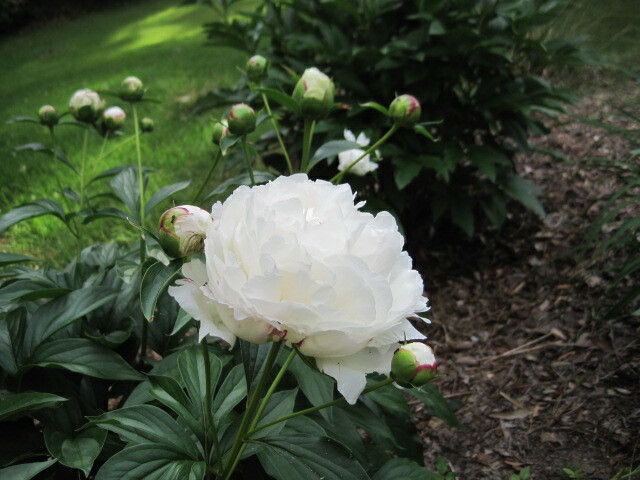 The peony is ivory colored, definitely not yellowish. I must have just taken the photo in terrible lighting.